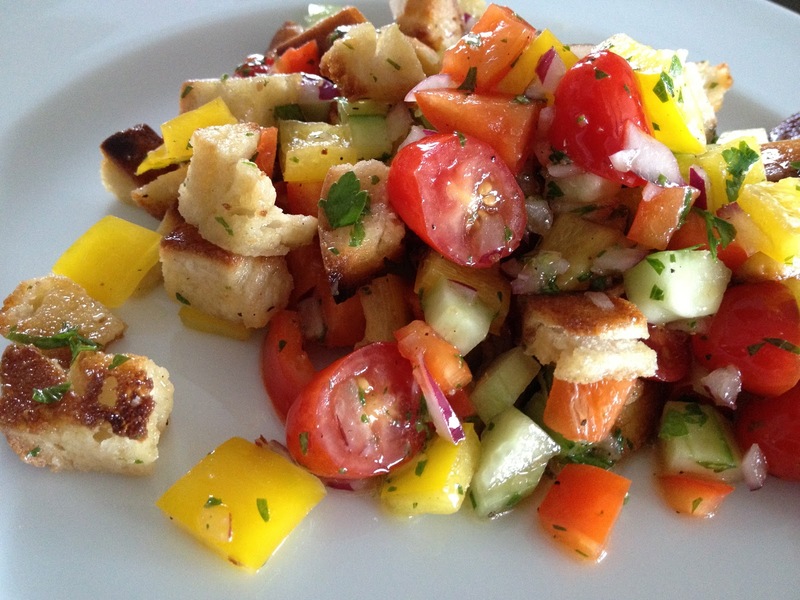 I loving making this classic bread salad with fresh summer cucumbers and tomatoes. Then, I add in colorful bell peppers, which I always have in the house, and toasted cubes of homemade bread, and there is usually none left! Cut the bread into cubes. Toss with olive oil, salt and pepper and place under broiler for 3 to 5 minutes or until crispy, like croutons. Whisk the dressing together and set aside. Dice the peppers. Peel, deseed and dice the cucumber. Dice the onion and cut the tomatoes in half. Chop the parsley. Mix everything in big bowl. Let the salad sit for just a few minutes to give the bread some time to absorb the dressing. Enjoy!